SamuelWhisky: The Creative Whisky Co. – Highland Park Single Cask 52,9% ABV! 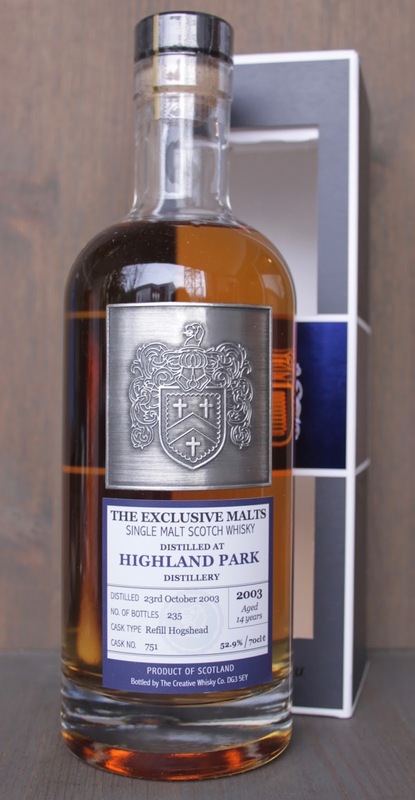 The Creative Whisky Co. – Highland Park Single Cask 52,9% ABV! Dear friends, followers and supporters alike! When working at this years Whiskyexpo in Linköping a while ago, Tommy and Peter of Svenska Eldvatten (Swedish Firewater) grabbed a hold of me to ask if I would be interested in reviewing one of their future releases, a single cask Highland Park from The Creative Whisky Company in their series The Exclusive Malts. Well, of course I was, and so I was given a sample. The cask number is 751, it's a refill (bourbon) hogshead that gave 235 bottles. It was distilled in October 2003 and bottled in 2017, and so the age of the whisky is 14 years old. Svenska Elvatten has managed to bring 55 bottles to the swedish market and you can view and order the product here, starting tomorrow. Ok, let's see what we have here! Wow, that was definitely unexpected! So much peat, very tightly connected with sea-salt (kind of, not coastal, but still). Very quickly the peat evolves and gets bigger and bigger. At this point the peat kind of resembles an ashy peat, in a style reminding me of Connemara/peated Cooley, which has never happened to me before with HP. The peat starts to evolve towards bicycle tube (rubber) but then quickly makes a turn and becomes, what can best be described as, very dry almond paste. Everything gets more and more earthy now, and here we actually have the heather honey! In fact, burnt heather honey, fascinating… When the dryness goes to sleep, slowly the milk chocolate says hi and everything clings off with a soft vanilla fudge that waters my mouth. Wow, that was some journey indeed! If you like very peaty and very salty HP, you should really try this one folks!